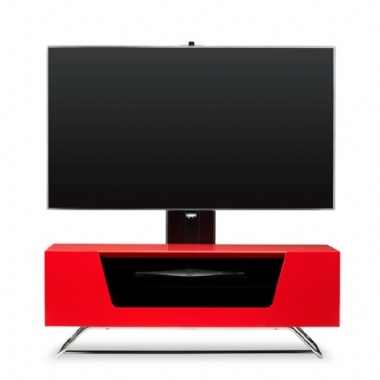 Alphason Alpha Chromium 2 Cantilever TV / AV Cabinet - Alphason’s new Chromium Colour range of Cantilever TV Stands offers a stylish and contemporary housing solution for the latest in audio visual technologies. This enclosed high gloss Black Cantilever TV Cabinet features a soft closing flip down door with IR friendly transparent glass. Available in 6 colours. The New Chromium Colour CRO2-1000BKT-BK has been designed to perfectly complement the latest smart super slim LED and Plasma screen televisions, along with the latest games consoles, Skybox, Apple TV, and other set top boxes, hard disc recorders and associated source equipment. This sleek modern design also features a Black glass top to match the deep high gloss finish of the Cabinet. Complete with built in cable management, internal middle shelf, and passive ventilation ensuring your equipment stays at an optimum working temperature. Supported on a stylish chrome base-frame, the Alphason Chromium Colour CRO2-1000BKT Cantilever TV Stand offers a stunning, timeless, yet contemporary look and feel, producing an almost floating appearance to your flat screen television.